A decade ago I bought what I initially thought to be a rare pair of medals, a Wepener QSA named to Nesbitt's Horse and accompanying KSA. The QSA was named to C C Calgey and there is certainly a C C Calgey who served in the Kaffrarian Rifles at Wepener. Despite the SA01 clasp on his QSA and KSA, surely it must be the same man? As you know from the title of the post, this turned out not to be the case and what I had actually purchased was the QSA to Christopher Charles Calgey (senior) and the KSA to Christopher Charles Calgey (junior). The father had attested in Nesbitt's Horse on 3 February 1900 aged 45. He went on to serve in CinCBG and earned the QSA above. His son, born in 1879 and aged 20 at the start of the Boer War, followed a different path. He joined the Kaffrarian Rifles, served at Wepener and was discharged 5 November 1900. He also served in the FLH (1043) and 1st ILH (2523 and 38324), 28 September 1901 to 23 April 1902. His KSA was issued by the ILH. As Sergeant, he served in the Great War and died of disease in East Africa on 11 Jun 1916. 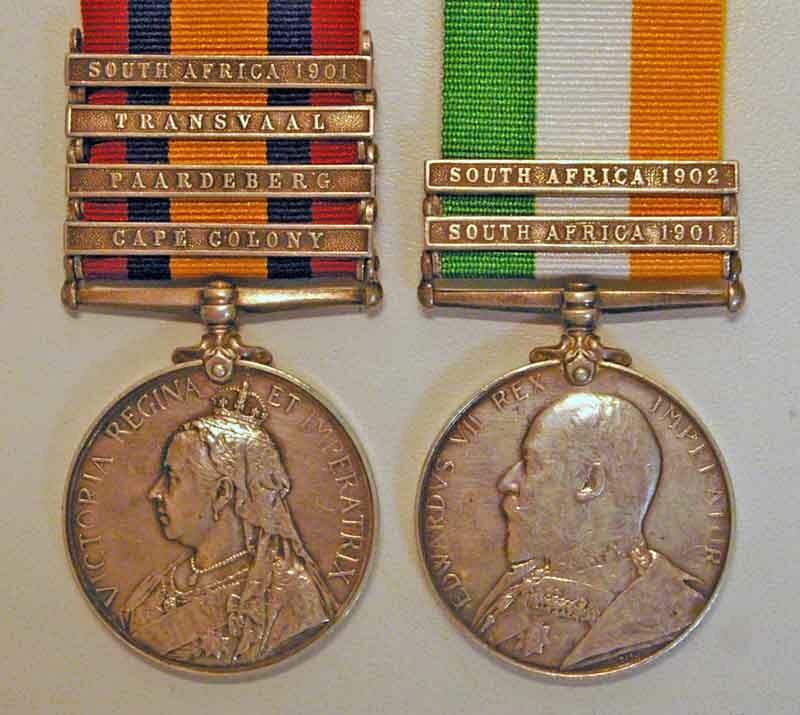 I am hoping that somewhere out there is the QSA (4) CC Wep Tr Witt to 1029 Private C C Calgey, Kaffrarian Rifles that will be able to join this pair of family medals. An understandable mix-up, hopefully the missing QSA and KSA are similarly paired together. It is just the Wepener QSA that is 'missing'. The Nesbitt's Horse QSA with SA01 is the complete entitlement of the father.